R4-G9, also known as "Geenine", is an the Astromech droid figure based on the droid of the same name in the Star Wars universe. 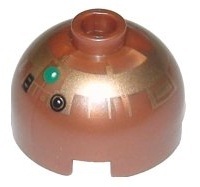 R4-G9's head is gold, with lighter gold printing used around the head for detailing. Black printing is used to outline certain mechanisms of the droid's head, and green and white printing is used to depict the droid's sensor. R4-G9's body has never been produced- the droid's head is simply attached to the wing of the Jedi interceptor. R4-G9 was originally assigned to Jedi Knight Aayla Secura, however Secura gave her to Kenobi along with her blue Jedi interceptor, which Obi-Wan used as his backup starfighter. When his red Jedi interceptor was destroyed along with R4-P17, Kenobi used this blue interceptor and Geenine on his mission to Utapau. This page was last edited on 9 January 2016, at 23:57.